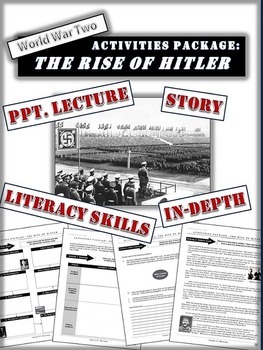 Hitler's Rise to Power - Activity Package - 20 Engaging Pages/Slides! An in-depth dynamic package focusing on Hitler's life from youth to his ascension to power in 1934. 1. Conditions in Post-WW I Germany. 2. A Story about Hitler's Youth (source unknown - no copyright listed for this story). 3. 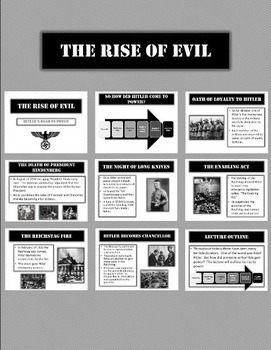 The Rise of Evil - An engaging and visually appealing ppt. lecture of how Hitler gained power from 1933-1934. The PPT is included with the download! 4. Hitler's Germany - A sample of actions/events that occurred in Germany once Hitler gained power. Also included is an mp3. of one of Hitler's speeches. This is a good "hook" to start with prior to showing the ppt. lecture. In conjunction with this package I often show the movie, "Hitler: The Rise of Evil." It parallels the events in the package very nicely.